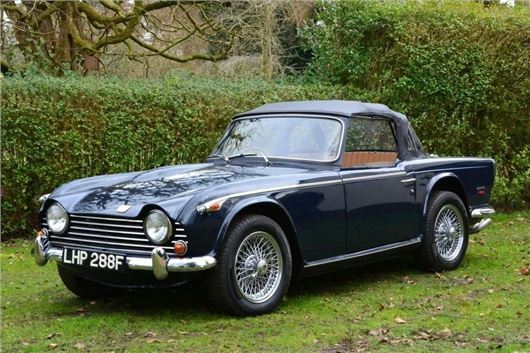 The first Triumph TR5 ever made is going under the hammer this week. Built for just one year from 1967-1986, the handbuilt roadster was long thought to have disappeared. It will now be offered for sale at Brightwells on 11 April. Visually, it’s almost identical to the TR4A but it includes lots of detail changes to improve crash safety. For petrolheads, however, the most important change was under the bonnet. Here was a 150bhp 2.5-litre straight-six that Triumph claimed made the TR5 the first production sports car with fuel injection, which helped it to a top speed of 125mph. Standard equipment included front disc brakes, all-independent suspension, rack-and-pinion steering and a four-speed gearbox. Only 2947 were built in total, of which only 1161 were in RHD for the British market. Around 350 TR5s are still thought to be UK registered today. Chassis number CP1 was the first TR5 made to production specification. A number of development prototypes had previously been produced, all with X-prefix chassis numbers, to test various components and to refine the myriad design details that would ensure that the process of mass production was as streamlined as possible. CP1 was handbuilt ‘off tools’ in the Project Development department at the Triumph works in Canley. CP1 was signed off as production ready on 5 July, 1967. The first few years of its life were spent as a press demonstrator, which led to its original engine being replaced. After its time as a hack wagon CP1 disappeared. Sold to the current vendor in 1997, the car was in a dilapidated state. Fortunately, the new owner worked at the British Motor Heritage (BMH) production facility in Faringdon, overseeing production of new Heritage shells for various MG and Triumph models. Handy if you’re restoring a TR5. The restoration progressed slowly over the next 12 years. The bodywork and chassis were restored in the BMH bodyshop using ‘new old stock’ parts where possible. The engine was overhauled while the fuel injection was set up by Lucas injection specialist ME & JW Pumford at a cost of £1674. Overdrive was also fitted. Since the restoration was completed, the car has been garaged and lightly used. A run of eight old MOTs back to 2010 show that it has covered just 200 miles since being returned to the road, the current MOT running until December 2018 with no advisories recorded. I worked for Triumph at the time and there are a number of points in your article above that do not ring true. Don't remember any such thing as a Project Development Dept and certainly not at Canley, all such work was done at Fletch North and in much smaller numbers than you imply.